monster from Beowulf? Photo: Wikipedia. There are still the long term injuries we know all too much about. Thomas Vermaelen will be back in training after the October international break. Michael Bolton fan Jack Wilshere will hopefully be back around then too, possibly with injured wrists from playing video games since his copy of FIFA 12 arrived yesterday. Meanwhile, Sebastien Squillaci has fallen into the abyss, possibly along with Abou Diaby, who is still recovering from ankle surgery. I have absolutely no idea if Tomas Rosicky is still out with his knee injury. No idea whatsoever. Or Bacary Sagna, who was removed from the match last weekend. Seriously, where was the team news yesterday? Predicted XI: Szczesny, Sagna, Mertesacker, Koscielny, Santos, Song, Ramsey, Arteta, Gervinho, Arshavin, van Persie. and no longer plays for Bolton? The Trotters are without striker Ivan Klasnic for the second match in a row, after he was sent off for head-butting Norwich City's Marc Tierney at the end of the first half of their match at the weekend; Klasnic served the first match of the suspension in the Carling Cup on Tuesday, which Bolton won 2-0 over Aston Villa. Bolton has a slew of long term injuries with which to contend. Marcos Alonso is set to return in a month from a broken foot, but Tyrone Mears is out until March and Chung-Yong Lee is out until May, both with broken legs. Meanwhile, Sean Davis (knee) and Samuel Ricketts (Achilles) have no return dates set. American international Stuart Holden, who picked up a severe knee injury at Old Trafford last year after a challenge from Jonny Evans, is a doubt to play, despite featuring in the Carling Cup during the week. Bolton were very busy in the transfer window, bringing in the likes of Nigel Rio-Coker, Chris Eagles, and David N'Gog on signings, plus adding Tuncay, Dedryck Boyata, and Gael Kakuta on season long loan deals. 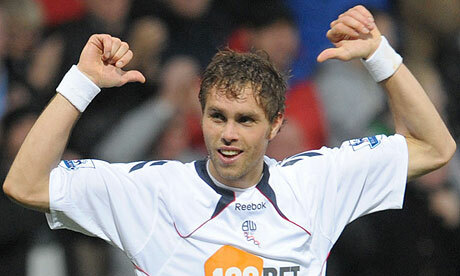 None of the three players who scored against Arsenal last year (Johan Elmander (pictured above), Daniel Sturridge, and Tamir Cohen) remain on Bolton's squad sheet. Also, does it bother anyone else that Bolton are nicknamed both the Wanderers and the Trotters, since they both mean pretty much the same thing? That's how I felt too on Saturday. Then I drank a bunch. I don't know why I just told you that. Pretty soon, the sample size of Arsenal's season thus far is going to approach some level of statistical significance. Five matches have been played thus far; by the end of this match Saturday, we will be just shy of one-sixth of the season being played. And Arsenal is in 17th place. 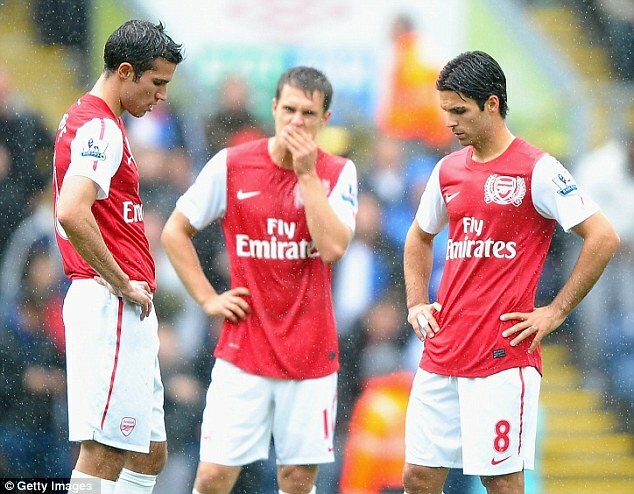 Visit the Web site Sports Club Stats to get a solid breakdown of how dire Arsenal's situation is right now. This site uses the sample of all matches played so far this season and then runs through 10 million simulations of the rest of the season (weighted for home advantages), to determine the distribution of possible season ending point totals. And where it sits right now is worrying. The odds of Arsenal being relegated at the end of this season, based on the numbers we have to work with right now, is a stunning 32.9%. It's still only September, so that number doesn't have as much significance as it would in January, when the simulator has more data with which to run and when there are fewer games decided by the computer. But it's still terrifying to see, from an Arsenal supporter's standpoint. As for Bolton, in the ten league matches since they beat Arsenal in April, the Trotters have won once (against QPR opening day) and lost the remaining nine. Arsenal have played nine in that same period and have won twice, drawn twice, and lost five. a corner kick. When does that ever happen? Bolton's 2-1 win at the Reebok over Arsenal on Easter Sunday was the Trotters' first win over the Gunners since a 3-1 win on November 25, 2006, where Nicolas Anelka had a brace. After that, they drew 1-1 in the FA Cup that year, Arsenal won the replay, and then Arsenal won the next eight meetings as well. In this fixture last year, played in early September, Laurent Koscielny's first Arsenal goal opened the scoring, but a defensive breakdown (what are the odds!) led to a Johan Elmander equalizer just before the half. Arsenal dominated the second, Bolton got frustrated and probably should have had about three players get red cards, and Arsenal got goals from Marouane Chamakh, Alex Song, and Carlos Vela in a 4-1 win. Vela's goal was particularly memorable, in that it came after a string of about 20 consecutive passes. But again, in April, Bolton won 2-1 at the Reebok. Daniel Sturridge's opening goal was canceled out by a Robin van Persie equalizer in the 48th minute, shortly after Bolton missed a penalty that could have made it 2-0. Bolton won the match on a 90th minute header from Tamir Cohen, off a poorly defended corner. How shocking. something that's absolutely fine with me. Photo: Guardian. The referee is Tyne & Wear-based Mark Clattenburg, from the Gosworth section of Newcastle. Arsenal won all four matches in which Clattenburg was in charge last year, and some of them were major victories. Clattenburg was in the middle of Arsenal's 3-0 win over Manchester City at Eastlands where Dedryck Boyata was sent off in the 5th minute, their 4-2 win at Aston Villa in November, the 3-1 day after Boxing Day win over Chelsea at the Emirates, and the 2-1 win over Huddersfield Town in the FA Cup where he gave Arsenal a penalty in the 86th minute. 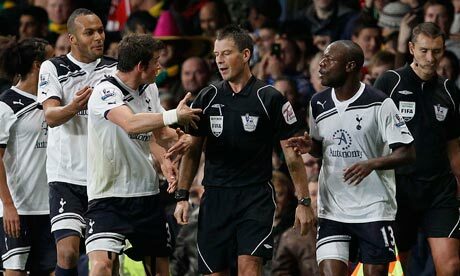 Of all the referees who take charge of big matches in the Premier League, I think I have the least bad to say about Clattenburg. Supporters of Everton and Tottenham would disagree with that. As for his record with Bolton last year, Clattenburg took charge of their 1-0 Carling Cup loss at Burnley, a 2-1 home win over Blackburn, and a 2-1 loss at Tottenham. He's also a licensed electrician! In the early Saturday match, Everton heads to Eastlands to face Manchester City and in the late match, Manchester United is on the road to face Stoke at the Britannia. On Sunday, Queens Park Rangers hosts Aston Villa in West London and on Monday, Norwich City hosts Sunderland.